NOTE: Some images, videos and resources on this site have not yet been optimised for very low bandwiths. They may take some time to download. GALS champion presents men's Gender Balance Tree at SMS Catalyst workshop, Kenya. 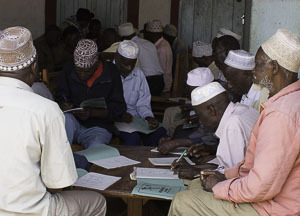 All 20 men committed to reducing adultery and alcoholism, joint property agreements with wives, joint decision-making and sharing money from coffee and other crops. 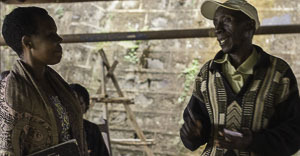 Gender Action Learning for Sustainability at Scale (GALSatScale) is a community-led empowerment methodology that can be adapted to different cultural and organisational contexts – including communities where no organisation exists, cooperatives of varying sizes, private commercial companies and NGOs and donor agencies. It can be adapted for any issue including: livelihoods, food security, financial services, value chain development, conflict resolution, governance, health, reproductive rights and climate change. Women and men coffee farmers discuss their visions and gender challenges in pairs at a catalyst workshop in SMS Embu, Kenya. 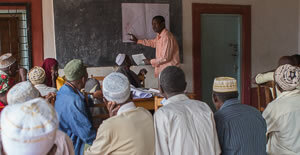 Catalyst Community workshop in Raa, Same Tanzania. 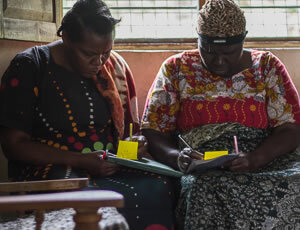 Women from Chome, Tanzania, draw their visions for good leadership. Each GALS process is unique. The implementation process and specific versions of the diagram tools used are designed with women and men community 'champions', an experienced GALS facilitator and a core of implementing staff/local leaders. The local adaptation is then upscaled through a combination on community-level pyramid peer training, organisational integration in existing activities and inter-organisational exchange. 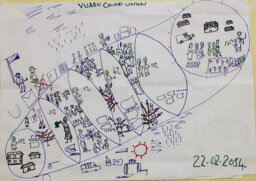 Vision Journey from Vuasu, Tanzania. Participant at SMS catalyst workshop, Kenya contributes to an Empowerment Leadership Map. Diagrams and visual communication are increasingly important in a fast moving world. Drawing and diagramming are important skills for creativity and innovation at all levels. They are not only for children or people who cannot read and write. 'Sketch-noting' and mindmapping are now common tools in higher level education and creative brain-storming in boardrooms of global companies. GALS develops ideas from information graphics, concept mapping and graphic design to facilitate clarity of concepts and analysis, innovation and equal communication between stakeholders from those without formal education to the most powerful. 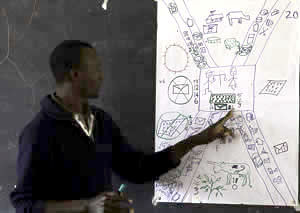 Participant at catalyst workshop in Raa Tanzania shows other participants how to do the Vision Journey. GALS facilitation aims not only to teach diagram tools and skills, but to catalyse discussion, awareness and motivation ‘from within’ the participants themselves so that they own the change process and are able to facilitate themselves. 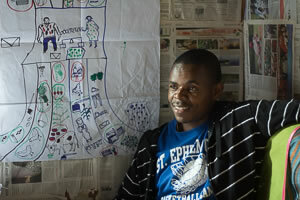 Lickson from Vuasu Tanzania with his tracked gender balance tree on the wall of his house.